Kold in Kazakhstan | Watts Up With That? There has been a lot of talk about the hot weather in Moscow over the last couple of weeks. This normally gets reported as the “hot weather in Russia.” But Russia is a big country, and much of it has been experiencing cold temperatures. The Caucuses and nearby Kazakhstan have been getting hit by one cold wave after another – as seen in the video below. 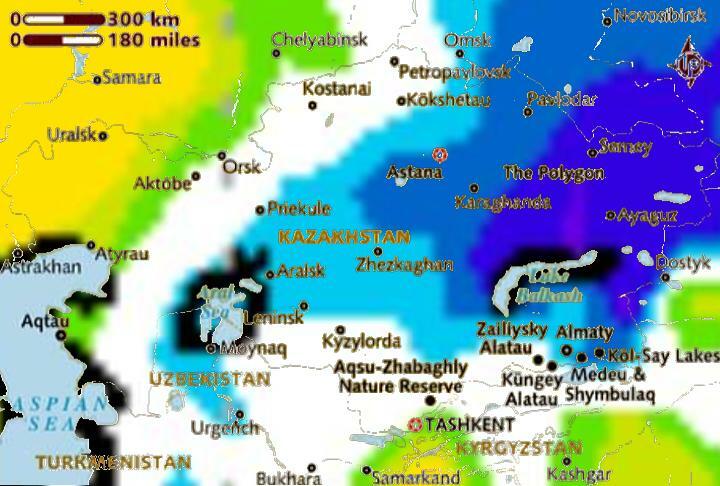 Closeup of Kazakhstan below, showing temperatures 10-15C below normal near lake Balkash. This past winter was one of the coldest on record in Siberia. In further bad news for Kazakhstan, Alberto Contador is leaving team Astana at the end of the year. Ryan Maue adds from his Florida State University weather map page, NCEP GFS forecast maps of 2-meter temperature anomalies for the globe and selected regions of the world. The anomalies are based upon the new NCEP CFSR reanalysis which extends from 1979-2009, and has the distinct advantage of being based upon a relatively recent incarnation of the NCEP GFS model (so sorta apples to apples). The climatological averages are based upon a 21-day centered average during the past 30-years. While western Russia bakes, the far east and Europe enjoys fall-like temperatures. Also, Invest 91L in the central Atlantic is becoming better organized and is poised to develop into a Tropical Depression during the next couple of days. Current long-range models put the disturbance east of the Bahamas in 6-days. August 1, 2010 in Climate News. 20 to 25° F below normal? Hell son, that’s just weather. Now a heat wave with wildfires and drownings is climate change — proof positive of C³ — catastrophic climate change. And you can take that to the bank; you know, the one that was bailed out with your tax dollars. I see that it’s cold in Quebec and Newfoundland where the ice sheets begin, and it’s also cold around the Antarctic Peninsula where it was supposed to be warming. Obviously weather! I find it very surprising and hard to believe that Siberians are unprepared for temperatures of 50 below. I was frequently in Nabarejne Celny in Tartaria in the former USSR in the 1970s working on the Kamaz truck plant and winter temperatures were often well below -40 centigrade with the lowest in my experience being -56 centigrade. I certainly was outside when it was this low – uncomfortable sure, but I did not lose any limbs. Children were only kept in when temperatures were below -20. I saw construction workers mixing concrete (mixed with antifreeze) for the Kamaz truck plant when it was -10 or so. Do my eyes lie or is the Antarctic continent basking in a +20c anomaly? In the depths of the coldest southern hemisphere winter in years the continent is covered in red, I doubt what I am seeing very much. What is the current Antarctic mean temperature at the moment? I wonder when Obama will flip to global cooling? After the November election? I wonder if the Warmista are giving due consideration to the timing of this event? Wherein we demonstrate once again that weather is not climate, unless the weather is warmer, or wetter, or dryer or more violent. It is always hot in the summer. Gets very hot. Cold in the summer is climate change. It is in the wrong direction. Not much of this news gets covered. The warmist sites are jealous of these vivid graphics. I am sure the european side of Russia has very different weather patterns than the asian side of the Urals. If it keeps getting colder, NASA will have to reduce the number of temp readings. It was rumored that during the Soviet era, Siberians often reported falsely lower winter temperatures in order to get more fuel- and firing ration. If that is true, there might look like a weather improvement, if we assume they report truthfully now to say. To put the heat wave into perspective. “An absolute temperature record of 37.2 degrees Celsius (98.9 degrees Fahrenheit) was registered in Moscow on Monday, a spokesman for the local meteorological bureau reported on Monday. So before Warmists jump up and down about global warming being the cause they have to answer what caused the 1920 and 1936 heat waves for example? Meanwhile they ignore the bitter cold of South America with single digits in the hothouse Amazon. Most people don’t know how big. Did you know that the distance between Moscow and Chicago is the same distance as from Moscow to the Far East of Russia? You are talking about the local heat in Northeastern US? Globally the earth has been cooling since 1999. And looking at the bigger picture the earth has been cooling for 1000 years. And an even bigger picture for 6000 years. What’s up with the Antarctic ocean? The map…. I don’t know about the Antarctic, but I see La Nina! As usual it is the poor hurting the worst. The poor, and elderly on fixed incomes, in America will hurt the worst if energy bills “necessarily skyrocket”. It won’t be only Peru were deaths occur in the cold. raised.” ” Too warm here in Eastern Washington (Tri cities)” Ok. For that and other reasons, I thought to myself-these folks are born Spacemen…. Kazakhstan has both one humped camels and two humped camels. Nevermind Russia, it looks like Antarctica is ON FIRE! 20C above normal for that whole area??? Really???? Well it’s “official” data so it MUST be true. Are those from high energy bills that drove pensioners to by discount books for heating fuel? 40,000, that is a very sad number. The same or worse will happen in the United States with high heating bills. I am shocked by that number. Mod, I’d like to use that in a piece I’m writing. I know you’re the mod and all, but can you post the link? Or just fire to my e-mail? I would be greatly appreciated. Thanks. I’m sure much of them died in an effort to cure mother earth of her fever, but it’s damned bitter pill to swallow. In the UK, no less. The warmth in Antarctica is pretty noticeable. The lack of warmth in the Arctic is also noticeable. Which would mean that as soon as summer is over, the ocean rolls over colder water below. Kiwi paper with Peru story.. temp decline over the past 3 or 4 years..
That is utter rubbish I’m afraid. BUT I would always prefer global warming to global cooling as would Al Gore, of course. NOAA almost always shows Antarctica very warm, even during months when UAH shows it much below normal. I don’t know what that is about. More than temperature maps, pressure maps would tell the tale. But for the purpose of fearmongering, the temps will do. Steve, my home town of Novosibirsk is in the middle of the current low temperature zone, and Western Siberia is still located in Russia, but Kazakhstan is a separate country now, vegetating under not-so-brilliant dictatorship of Mr. Nazarbayev and his kin. Transcaucasian republics (Armenia and Georgia) are also independant countries. Mr. Horton above mentions that, according to his observations, Siberians are used to minus 50°C cold. I wouldn’t qualify his statement as correct if it’s applied to the most populated parts of Siberia. I was born and grew up in Western Siberia, and minus 42-45°C was considered rather extreme. Minus 50°C is a disaster. Petrol starts to freeze, all machinery stops, and people stay indoors. The vast but almost unpopulated region in Central Eastern Siberia (north of Yakutsk) is famous for frequently hitting as low as minus 50°C. But more populated Southern Siberian areas along the Trans-Siberian railroad, where major cities are located (Omsk, Novosibirsk, Irkutsk, Krasnoyarsk) rarely experience temperatures lower than minus 40°C, and even that is usually considered dangerous enough to close schools. I remember going to the Soviet school when it was minus 42°C (the school was at 5-minute walking distance) but most children who lived farther out would not come to school when it hit minus 40°C. May i suggest the following reading: Dynamic Analysis of Weather and Climate, M.Leroux, Springer 2010 where such questions are well answered among others? Local temperatures are only relevant when they are above average. High temperatures are climate, low temperatures are weather. Steve, my home town of Novosibirsk is in the middle of the current low temperature zone…. BRRrrrrr -35C was cold enough to cause a friend and I to have frostbite while waiting for a school bus in New York. Thanks for the first hand info. As for a piddling several degree Centigrade rise, I would like to point out that Ottawa (my eponymous city) varies in temperature by 60 centigrade every 6 months. If I read the anomaly is correct, one of the coldest winters days in Melbourne is 5°C warmer than average? Currently suffering in 99 deg F, my sympathies are somewhat limited. The question is: Is it better to die from heatstroke or from frostbite? It’s been going on for years topping over 25,000 regularly each winter. Imagine if the same number died during the recent heatwave in the UK. “We must act now.” Yet poor pensioners are treated like badly! During last winter, we had SIX WEEKS of continuous sub-zero temps, bottoming out at -20 degrees centigrade, in my home county in the lower Rhine area of Germany, where winters are supposed to be ABOVE zero normaly, with only a handful of days showing sub-zero temps every other few years, or so. This may sound funny, compared to regular siberian winter temps. But it ain’t funny anymore, when cities with millions of inhabitants are completely unprepared for such harsh winters and their economies come to a screetching halt for weeks on end, due to (unaccustomed) cold weather. That is utter rubbish I’m afraid. Other sources: click, click, click. This is nothing unusual. See the 1998/99 and 1999/200 winter excess deaths of over 40,000 for each winter click. I respect your sceptical mind but you must back up your sweeping statement with evidence. Neither are any fun ( it was 99F here in NC for the last week) but I think frostbite is worse. It is VERY painful as you thaw out and the damage never goes away completely. With heat stroke you feel awful but you are not usually screaming in pain as you recover. (cool shower) That why I moved south among other reasons. Maybe I am reading it wrong but it looks like excess winter deaths in the UK have actually been coming down since 1950! Something to watch: When does snow first fall in interior Russia (Siberia)? The intense, cold winter Arctic air masses get their roots from Siberia, which is cut off from any moderating influences. The sooner snow falls there…. I’ve long been intrigued by the notion of hearing the “Whisper of the Stars” which is possible at -50 C (-56 F) but having encountered a low of only -33 F I’m still waiting. Western Siberia experienced 3 months of -30c temperatures this past winter, the result of HP agglutinations too. Doh! Found that missing heat…. …It was stored in the ice. Jimbo, you’re probably not reading it wrong. I’m going off of somewhat vague memory here, but I believe that is attributed to having far more energy available, and the concomitant increase in living standards, better housing, better nutrition, along with advanced medical technology running the gambit from ‘simple’ flu shots to ICU’s with respirators, I would expect that ‘excess winter deaths’ in any developed nation probably have decreased since the 50’s. I’d hate to know what the direct deaths due to cold were in Mongolia this past winter. Let alone the ‘excess winter deaths’ which somehow I suspect would be difficult if not impossible to even calculate there. They apparently lost a fifth of their livestock, some 10 Million animals to the cold. As far as I know, “Whisper of the Stars” is a poetic legend. Water vapor that we breath out into the cold air almost instantly becomes part of that air (Siberian air in winter is very dry, most of the moisture falls down as snow, and stays on the ground). I never heard any crackling or tinkling sound, even when it was minus 46°C. But there’s one thing that’s real — though many people don’t believe me. As children, we used to play hockey on ice, even when it was quite cold. We had our own unscientific “criterion” to decide if it was too cold to play: one or two of us would spit, as far as possible (5 to 6 yards, I guess) over the ice. If we would hear then a distinct crackling sound of ice falling on ice, we would decide that it was too cold to play (usually it happened if temperature was somewhere below 36-38°C). One needs to be careful in Siberian winter. When I was in my twenties, I used to go skiing alone into the forest, though I never had a stamina of a good skier. One beautiful, crispy sunny day, about minus 25°C, with lots of fresh snow everywhere, I started out a bit late, and somehow went much farther than was good for me. I lost my way in a dusk, and spent hours trying to find my way back home. It soon became very dark and cold. Probably, I became somewhat delirious — I remember distinctly hearing low plangent voices talking to me from the snow banks under the black firs, calling and threatening at the same time — but I forced myself not to stop, walking in some kind of automatic hysteria, remembering my grandparents’ words who always warned me that the most dangerous thing in Siberian winter is to stop and to fall asleep in the snow. I don’t remember how I got home but I did. The next two weeks I spent in bed, in high fever. Since then, I sort of lost any interest in skiing alone in the forest. My son is visiting Siberia (Novosibirsk) now and won’t be in Smolensk for a few weeks. I’d ask him what is going on but he doesn’t even have dial-up where he is. When he gets to Smolensk he says he may have 56KbS occasionally. Quite a come down from the 10 MbS he is used to here. What looked like it would be a year of record crop yields in the midwest USA earlier this year is going to turn out average. 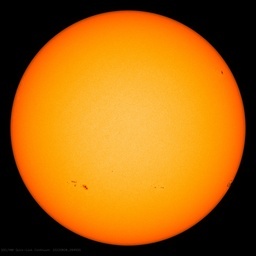 Battered by solar wind and cooked by triple, or nearly triple, digit temperatures. Cannot access agricultureonline.com right now, hope its not gone like StormX-change, its getting really difficult to monitor crop progress reports other than the USDA. I like hearing it from the actual farmers. But my own eyes have seen (some of it immature) corn roasting and turning quite brown in the fields, and any late beans look, well, rather badly stunted and thin. Its very dry and hot in the lower plains and Mississippi delta states. This does not mean what you think it means. When people die, they have to die some time of the year; somewhat more of them do in winter than in summer. This is completely normal. If people died at the same rate the year round, around 150,000 would die in the winter in a typical year. If 190,000 died instead that would be labelled “40,000 excess deaths”. As it happens, total deaths have been unusually low this year at only around 500,000 reported, so the winter deaths (with the “40,000 excess”) amount to only around 165,000 (which is just 15,000 above the historic year-round average rate and well below the historic rate for winter deaths). It was a cold winter, but that had very little if any impact on the death rates. People were not “dying of cold” (or only a very few in exceptional circumstances, like mountain climbers getting lost). There’s no story here. total deaths have been unusually low this year at only around 500,000 reported, so the winter deaths (with the “40,000 excess”) amount to only around 165,000 (which is just 15,000 above the historic year-round average rate and well below the historic rate for winter deaths). Bogus manipulation of data doesn’t change the fact that there were a lot more cold related deaths in the winter season than heat related deaths in the hottest summer . Cold kills, and not just lost mountaineers. I suspect Paul writes from a PC in a nice centrally heated house with sufficient income for his piped gas. I’m fed up with the carbon tax and just axed up 2.5 tonnes of seasoned timber for my new woodstove with backboiler. There were neither. Temperature as such kills very few people in the UK (or anywhere else probably). Hot or cold. The reasons for the “winter excess” are much more subtle, and largely psychological and epidemiological. Like almost everyone else in this country. Pensioners especially (this is the demographic with the highest disposable incomes). Relative to income, it is much cheaper to heat houses today than fifty or a hundred years ago. We are also better fed. Which is why we wear fewer and lighter clothes. Look at the old films; everyone wore a hat; nowadays you seldom see one. I seem to remember reading that these figures atributed to deaths from cold are in fact carefully adjudged and appear as such on the death certificate as a contributary cause. Like almost everyone else in this country, Pensioners especially (this is the demographic with the highest disposable incomes). Relative to income, it is much cheaper to heat houses today than fifty or a hundred years ago. We are also better fed. Which is why we wear fewer and lighter clothes. Look at the old films; everyone wore a hat; nowadays you seldom see one. What absolute b@ll@cks. Many pensioners in this country have disgracefully small state pensions – especially some of those who live alone. Others are terrified that the inflation which annually eats away at their income, and the now pitiful return on their savings, exacerbated by thieving bankers who drop their interest rates to fractions of a percent, will, if they live a few more years, leave them unable to eat as well. UK govt. is currently soaking the pensioners living from savings and fixed income by using 5% inflation and interest rates of 1.5% to cure the financial disaster and save the banks – no-one is bothered by the death of the poor pensioners and it seems least of all you. Weather is not climate unless weather is climate change. At least our “local” meteorologists get it, namely at WNEP-16 (Wilkes-Barre/Scranton). The weekday morning guy Joe Snedeker does his weekly science-type Wham Cam segments where he asks random people something, usually weather related, then presents the answer with the science involved for understanding it. For the latest one he was asking What is the average temperature of the planet? (56°F BTW) This was last week when we had a “heat wave” of 85-90°-ish days. Snedeker told the one guy how the global temperature is going up, as it has since the last ice age, which is called global warming. During the after-segment segment, they flashed a familiar Hansen-type graph and, paraphrasing here, Snedeker said by the grid used by NOAA the temperature has gone up by about a degree over the last 150 years, and how much of that is tied to man is the question. The segment is worth watching, geology types might like it. They were at a public pool with exposed smooth bedrock with glacial scrapes. Snedeker was saying how that place was under a mile of ice just 10-15,000 years ago. The deaths specifically attributed to cold on death certificates are quite distinct from the winter excess, and very much fewer in number. Again the last word is given to Greenpeace… but russians scientists are not gullible and know that they live in a continental climate, they also understand that high pressure agglutinations are at the source of the increasing contrast between seasons in contradiction with the global warming hysteria that Shusters and TIME in clear partnership with Greenpeace are flogging in the west. Re posts by Paul Birch on excess winter mortality. Many studies demonstrate links between winter mortality and climate, even quantifying the increase in mortality per degree drop in temperature,16 ,17 yet outdoor temperature alone cannot explain all excess winter mortality. The article goes on to discuss various aspects such as cold homes, ‘fuel poverty,’ differing rates in different nations, etc. If I recall correctly, in the USA, you get higher excess winter deaths the further north you go. This may have to do with vitamin D levels, or other factors also. But there is no question that the colder the winter in a particular nation, the higher the number of excess winter deaths, when you compare over a number of years. The greatest excess winter deaths are apparently seen in countries with relatively mild climates. This is suspected to have something to do with our bodies acclimation to cold… in mild climates, we don’t have much chance to acclimate to cold, especially if we mainly stay inside when it is cold – typical work days in heated offices, home in heated cars, to heated houses…. Still the point is that excess winter deaths are directly linked to cold and not a random thing – you look at one year in a particular nation, with an average winter temperature that year, and then look at other years in the same nation and if the weather is colder, you get more excess winter deaths, and vice versa. Precisely. It’s not the temperature. It’s the season. Winter is the season for dying. If there were no seasons, people would still die at pretty much the same average rate. Most of the winter excess is from people who would probably have died within six months or so anyway. If more people die this winter, fewer will die next summer. It’s not random. But temperature isn’t the driver (for more than a small fraction of cases). What matters most is the amount of sunshine. Shorter, dismal days and longer nights sap our strength and fighting spirit, leaving us more vulnerable to infections and less able to throw them off. They also promote the spread of diseases, in part, perhaps, because less sunshine means less UV to sterilise airborne germs. This would be consistent with Svensmark’s hypothesis, in which the cooler periods are the result of more cosmic rays producing more clouds and thus less sunshine. As for last winter in the UK, it was a cold one, but not a particularly dark one. The total number of winter deaths was on these figures somewhat lower than the average. The “winter excess” only appeared on the high side because the total deaths last year were unusually low too.